Despite Trump's promise to protect them, Christian refugees struggle to enter U.S.
WASHINGTON — Despite vowing to help vulnerable Christians around the world, the Trump administration is making it harder for Christian refugees to enter the U.S., including a group of Iranian Christians who remain in legal limbo in Austria awaiting a decision on their fate expected as soon as Wednesday. The number of Christian refugees granted entry into the U.S. has dropped by more than 40 percent over the past year, a decline of almost 11,000 refugees. They have been caught in the wider net of President Donald Trump’s tough stance on immigration and refugees, which has lowered overall refugee admissions by the same percentage. The contrast between the administration’s rhetoric and its actions has disappointed Christian activists and prompted accusations of hypocrisy from rights organizations and members of Congress. "Ironically, these policies, while clearly aimed at Muslim refugees, ensure that Christians and other religious minorities from many of the countries on Trump’s list of suspect travel ban nations are also kept out," said Mary Giovagnoli, director of Refugee Council USA. "It suggests that the president has no real interest in religious persecution or the tenets of religious freedom." But a Trump administration spokesperson rejected the criticism. 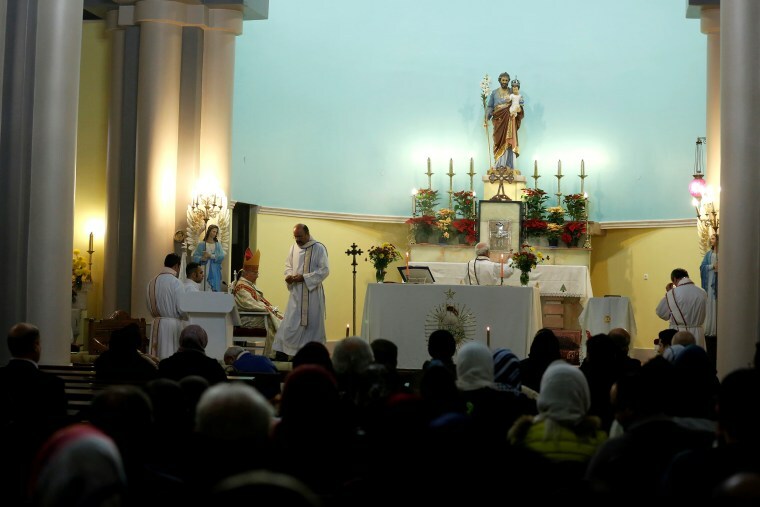 “The administration has made helping persecuted religious minorities in the Middle East a top priority,” the official said, citing humanitarian aid delivered to Christians and other vulnerable communities in northern Iraq. The plight of 87 Iranian refugees illustrates how Trump’s tough line on refugees from mostly Muslim countries has also closed the door to Christians and other religious minorities trying to flee to safety in the U.S. The group of Iranians is mostly Christian, including Armenians and Aramaic-speaking Assyrians, but there are also representatives of other religious minorities — Zoroastrians, Mandeans and Jews. The Iranians have been stuck in a legal purgatory in Austria, some for as long as two years, as they await entry into the U.S. This week they expect to learn whether the U.S. government will issue them visas, in individual decisions issued by the Department of Homeland Security expected Wednesday. The Iranians in Austria applied for admission to the U.S. under the Lautenberg-Specter program, which was designed as a pathway to America — via a short stay for processing in Vienna — for religious minorities fleeing oppression from the former Soviet Union and Iran. Until now the program — which dates back to the Cold War — has operated smoothly for years, with an acceptance rate close to 100 percent. But due to unprecedented delays, the short stay has stretched into as long as two years for some of the Iranians in Vienna, where they are unable to work and have become destitute. After the Iranians were denied visas with only cursory explanations, a refugee rights organization, the International Refugee Assistance Project, successfully sued the U.S. government in a class action suit on behalf of the Iranians and their family members, accusing DHS of violating the terms of the Lautenberg law. Under a federal court order, DHS must provide specific reasons if they again deny entry to the refugees. One of the refugees, referred to in anonymous testimony in a court filing as Jane Doe 5, is an Iranian Christian widow stranded in Vienna with her 90-year-old father and disabled son. One day she was assaulted in broad daylight at a local market, she said, but chose not to report the incident to police because her assailants warned her she would face criminal punishment. Her U.S.-based sister-in-law applied on her behalf to the Lautenberg program, which she believed, based on the experience of her acquaintances, "had a near 100 percent acceptance rate" and would require her to stay in Austria for just two to four months. “I sold most of our possessions at below market rates in the expectation that we would not be returning to Iran,” Doe 5 said. She traveled to Vienna in Feb. 2017 and was interviewed by DHS personnel. A year later she, her son and her father got identical letters denying their entry, checking a box indicating “other reasons” as the basis. "Mass denials of Iranian religious minorities stuck in Vienna demonstrate how religious minorities have been harmed under this administration,” said Mariko Hirose, litigation director for the International Refugee Assistance Project. Refugee advocates told NBC News some of the Iranians have become homeless and some have taken to selling their blood plasma to help them feed their families. While the Iranians have waited in Vienna, evangelical Christians from Ukraine or other former Soviet republics have secured visas under the Lautenberg program without major delays, refugee resettlement agencies said. Christians, unlike some religious minorities, are recognized under Iran’s constitution but regime authorities regularly raid churches, arrest and imprison Christians and target evangelical Christian converts, according to a report by the U.S. Commission on International Religious Freedom, a federal commission. Vice President Mike Pence, who has helped rally support among evangelical Christians for the Trump administration, has warned that the survival of Christian communities in the Middle East is in jeopardy and says that the U.S. stands ready to help. While Pence has sought to shine a light on embattled Christians, a vocal wing of the administration led by presidential adviser Stephen Miller has championed sharp restrictions on the admissions of refugees and visa holders from countries deemed a security threat. As a result, Christian refugees have become “collateral damage,” one aid worker said. Overall, as the administration has ramped up its “extreme vetting” of refugees and visa applicants, the number of Christian refugees admitted to the U.S. has fallen by 43 percent this fiscal year. As of Aug. 29, the number admitted in this fiscal year has plunged from 25,162 in 2017 to 14,289, in 2018, according to the State Department. Katie Waldman, a spokeswoman for DHS, defended the new procedures, saying "the security improvements in the refugee program made in recent years to mandate additional screening for refugee applicants undoubtedly makes Americans safer." At the 2017 conference where Pence made his speech about Christianity being under siege, including in Syria and Iraq, two Christians from Syria were scheduled to take part in a panel. But the two men were denied U.S. visas, according conference organizers, and could not attend after all. While Christian refugees face difficulties securing U.S. visas, hundreds of Iraqi Christians already in the U.S., many of whom fled their home country years ago, are now facing the threat of deportation. About a month after the vice president’s speech on Christians on May 11, 2017, U.S. authorities began arresting hundreds of Iraqi immigrants in Michigan and elsewhere. The Iraqis were told they had violated immigration laws and were threatened with immediate deportation. Many of the Iraqis were Chaldean Christians and had been living in the U.S. for years, even decades. The American Civil Liberties Union filed a class action suit to stop their mass deportation and won an emergency injunction in federal court last year. The Iraqis were given the chance to have their cases heard by immigration judges. There are still 120 Iraqis in detention, including dozens of Christians. The ACLU recently filed a motion accusing federal authorities of providing misleading and false evidence in the case about the Iraqi government’s willingness to repatriate the Iraqi nationals. Philippe Nassif of In Defense of Christians, a rights group focusing on religious minorities in the Middle East, said the White House deserves credit for drawing attention to Christians in the Middle East, holding Turkey to account for its imprisonment of a Christian pastor, Andrew Brunson, and for channeling humanitarian aid to help once-thriving Christian communities that have dramatically dwindled over the past decade. But he said the administration needed to revisit its refugee policies. “To just slam the door shut on these communities is not the right thing to do. It doesn’t help the United States image and doesn’t help these communities feel like somebody really has their back,” Nassif said.